Over the past couple of weeks the team and I have been slowly but surely developing a list of all of the behaviours that we have seen the monkeys carry out. This is with a view to creating an ethogram for use in our time-budget analysis and for future researchers to be able to use. To start gaining a better insight into the behaviours that this species carries out, we had to sit and watch for hours on end, noting down anything and everything that we saw. At the end of every day, we sat down and compared notes, and discussed what could be defined as different behaviours, and perhaps where there might be some potential overlaps in behaviour. A couple of examples where our discussions about how to define certain behaviours went deep into the night were with different types of locomotion, and being able to define aggression. 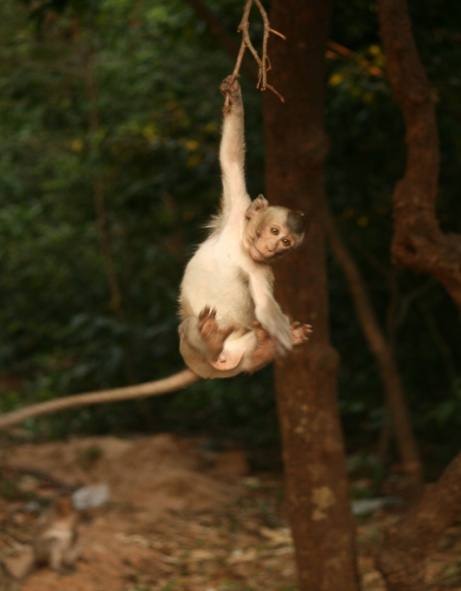 What with all the differing types of movement that a monkey displays when getting about, such as walking, running, climbing, jumping, and the odd swing and cartwheel, we knew that if we had to write down every time they moved from a walk to a run to a jump, we would be constantly writing and most likely start missing behaviours in our observations. 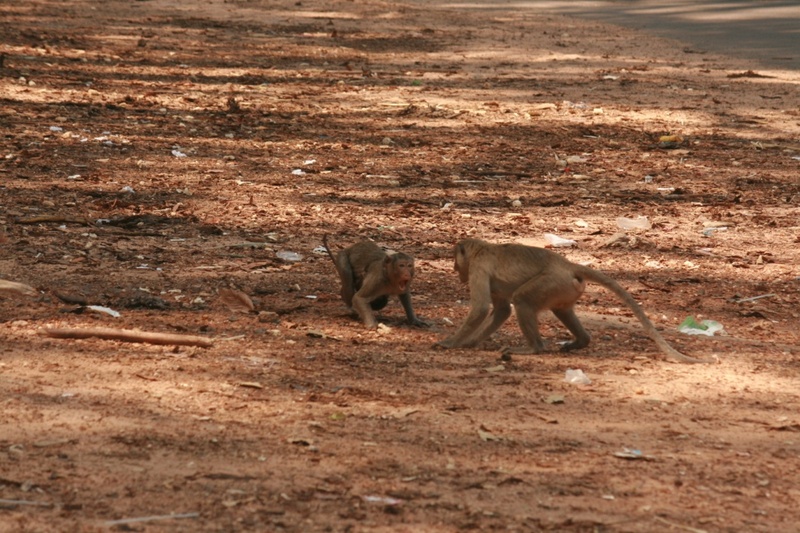 Defining when a monkey was being aggressive was also difficult to decipher as with the younger monkeys it seemed to be a case of play, rather than an attempt to attack another individual, or warn them off. 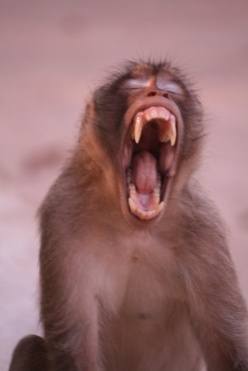 Was this seeming aggression amongst the younger monkeys mere practicing for when they were a bit older? In order to create more reliable results, and an easier-to-use ethogram, we grouped all movement as locomotion, and then stated whether it occurred on the ground or up in the trees (arboreal). When aggression occurred between younger monkeys it was defined as play, and in older individuals, it was defined as aggression. We are aware that with more time observing the monkeys, overlaps between these will occur, and with more experience with the species we hope to be able to better define these behaviours. In addition to writing all of the behaviours down and defining them, I have been endeavouring to photograph all of these behaviours in order to create a photographical ethogram for use by future researchers. Some of these behaviours were a lot easier to capture than others. For example, we knew that the monkeys could sometimes be found swimming, but this behaviour completely eluded us whilst we were there, although during the many hot days we came across some very wet looking monkeys. Writing this particular entry has got me thinking about all of the other problems that we have encountered during our time studying these monkeys. I couldn’t possibly go into all of the issues that are associated with working with these monkeys, but I shall try to cover the main ones. First and foremost, the sheer amount of monkeys present in the forest (700+), although this was useful in terms of getting a greater sample size for our research, it did provide some problems with how skittish they were, and being able to keep track of the individuals that you were observing. Great care also had to be taken not to bring any food or drink into the forest, as the monkeys were quick to spot this, which would lead to aggression directed towards us, and a bias in our research – this can be quite difficult when you are in temperatures exceeding 30°C all day. People provisioning the monkeys also tended to upset our observations somewhat. For example, numerous times we would be observing some monkeys, then all of a sudden a car horn would sound and they would all sprint off in the hope of getting some food. As stated earlier, the hundreds of monkeys that would run over to try and get some food would make it nigh on impossible to follow the monkeys that you were focusing on. Observing the monkeys in the trees was also very difficult, so our observations when in the dense forest would be subject to ceasing suddenly as the monkey disappeared out of sight with an agile leap. Although there are a lot of difficulties associated with observing these monkeys, so far it has been a great learning experience, and I look forward to updating you further on how things are going in the near future. 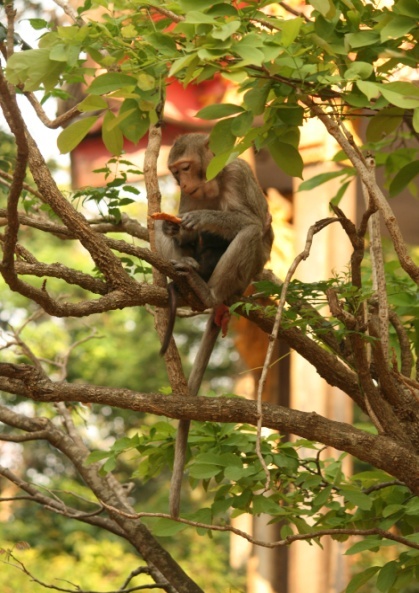 This entry was posted in Long-tailed Macaques, Macaques, monkey forest, Monkeys, Research and tagged Don Chao Poo Forest Phana, Long-tailed Macaques, Macaca Fascicularis, Macaques, Thai monkeys. Bookmark the permalink.